"Some days are like that...Even in Australia." We all can count upon having a bad day now and then, it is what happens. What I try to remember is that there are those whose day is probably worse than mine, so, be strong, push through. The quotation from Judith Viorst's children's book has long been a quotation that I think of when things get tough. But....my question is, does this also apply to months? I think it must. What a month it has been. Meshed in among all of the above we was hosting a family dinner for visiting out of state family, a trip to Seattle to help my daughter as her hubby had to go to....wait for it....Australia.... I got sick so I wasn't really much help.....came home and began the laundry that had been piling up for a long while. It was either do the laundry or go to the store and buy new necessities! Watching the washing machine could be therapeutic. Ha! 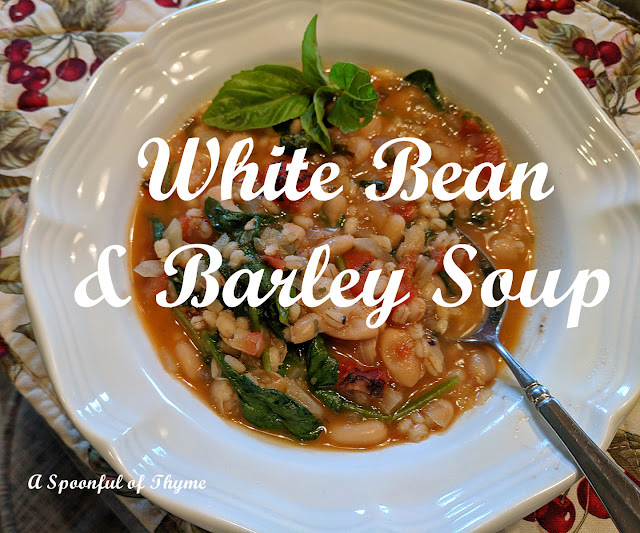 Thankfully, I had made this easy, soothing, flavorful, and delicious Bean and Barley Soup before the dominoes began falling! It is Saturday! It is the third Saturday of May! 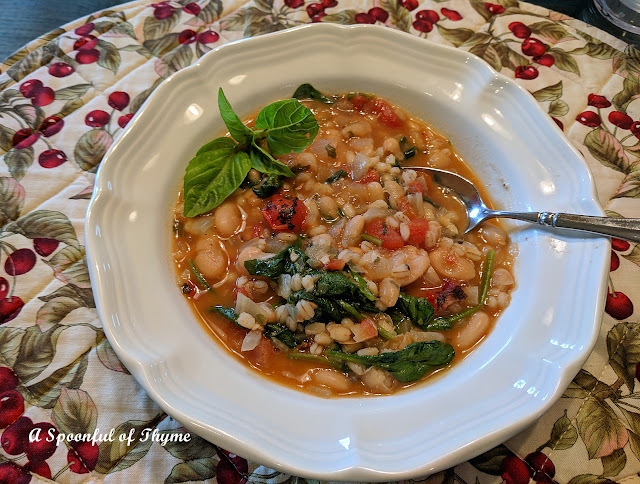 I am to make a soup with the theme that Paula at The Saucy Southerner selected for the Soup Saturday Swappers: Let's Go Meatless! What I learned in making this soup was that all vegetable broths are not created equal. The broth that I found at Trader Joe's exceeded the other brand I had purchased...hands down! If you haven't tried it...do so! Heat oil in a Dutch oven over medium high heat. Add the onion, fennel, garlic, and basil. Stirring frequently, cook the mixture until it begins to brown, about 8 minutes. Mash about 1 cup of the beans. Add the mashed beans, remaining whole beans, tomatoes, broth and barley into the pot and stir. Bring the mixture to a boil. Reduce the heat to medium and simmer. Stir the mixture occasionally, until the barley is tender, about 15 minutes. Stir in the spinach leaves cooking until wilted. Remove the mixture from the heat and stir in the cheese and pepper. Notes: The soup may be refrigerated for up to three days. It freezes well for up to six months. 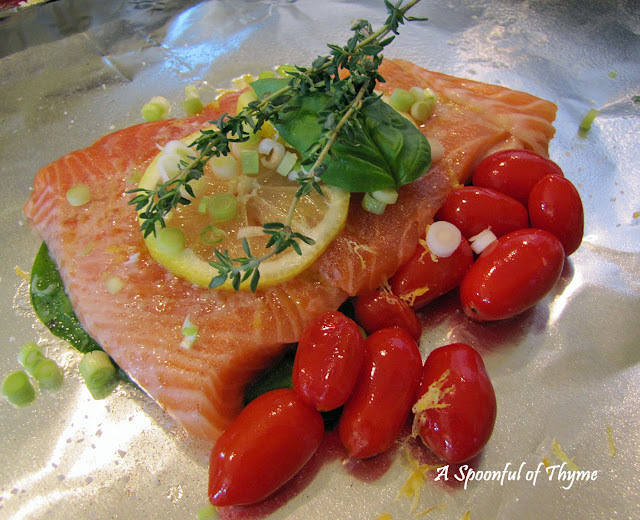 This would be a great soup for a girls' luncheon served with some crusty bread! I know that I will definitely make this soup again. In fact I have some friends coming next week....all I need is the fennel!